Pyrite and Galena are important sulfide minerals but they are different from each other in various aspects. Pyrite is iron ore while galena is lead ore. This is the main difference between them. The chemical formula of pyrite is FeS2; it is sulfide compound of iron where as galena is sulfide compound of lead with the chemical formula PbS. The color of galena may vary from light gray to dark gray while pyrite is generally brass yellow in color. For this reason pyrite also termed as fool’s gold. Though it was named as fool’s gold some time it really contains gold. Auriferous pyrite is good example of pyrite mineral where gold occurred with pyrite. Pyrite generally occurs with other sulfides orÂ with other oxidesÂ inÂ quartzÂ veins,Â metamorphic rock and sedimentary rock. It also found in coal mines and sometime it occurs in fossils as replacement of minerals. On contrary, galena often found associated with silver sulfide as argentiferous galenas. Apart from this, this lead ore also contain variable amount of zinc, cadmium, antimony, arsenic and bismuth. Galena produces a higher electrode potential than that of strained pyrite, simply because of it strain energy. Pyrite shows magnetic property on heating while galena is nonmagnetic in nature. 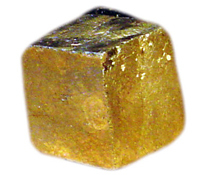 Pyrite is generally used for commercial yielding of sulfur- dioxide. This sulfur dioxide used for commercial production of sulfuric acid as well as it play major role in paper industry. Pyrite is also used as mineral detector in the radio receiver in the beginning of 20th century. It is still in used by some hobbyist. Pyrite is a semi conductor and has a strong capability of absorbing light thus it is used as an inexpensive composite material for photovoltaic. Galena is also semiconductor it was used in early wireless communication system. It works as point contact diode in crystal radio set. Galena is used as crystals of crystal radio set.Â In ancient Egypt galena also used as ‘Kohl’ or mascara to protect eyes from glare of the desert sun as well as to keep files away from face. It also used in manufacturing of a device called cat’s whisker. 1. Galena is lead ore with formula PbS while pyrite is iron ore having formula FeS2. In Other words, Galena is sulfide of lead and pyrite is sulfide of iron. 2. Galena is gray in color, it can be different shades of gray from light to dark, where as pyrite is brass yellow in color and often termed as fool’s gold due to its gold like appearance. 3. Though both are sulfides but specific gravities of both are different from each other. 4. Both galena and pyrite have density of 7.4 gm/cc and 5.01 gm/cc respectively. 5. Pyrite shows magnetic property on heating which galena is nonmagnetic component and doesn’t bear any magnetic properties. 7. Both are semi conductors but they are used for different purpose. lancetana. "Difference Between Pyrite and Galena." DifferenceBetween.net. October 29, 2009 < http://www.differencebetween.net/object/difference-between-pyrite-and-galena/ >.